The town of Addison is west of Middlebury. Chartered in 1761, it is still very much a town that is driven by agriculture. The topography is rolling and the sky is big. Addison's western border is Lake Champlain, so some of the properties there will benefit from lake frontage and/or Adirondack Mountain views. Near the center of town is Dead Creek Waterfowl Area. This is a beautiful spot to canoe, fish, hunt or simply bird watch. There is also the Dead Creek Water Fowl Preserve. This region is a "fly zone" for the Canada Goose and the Snow Goose during migration. 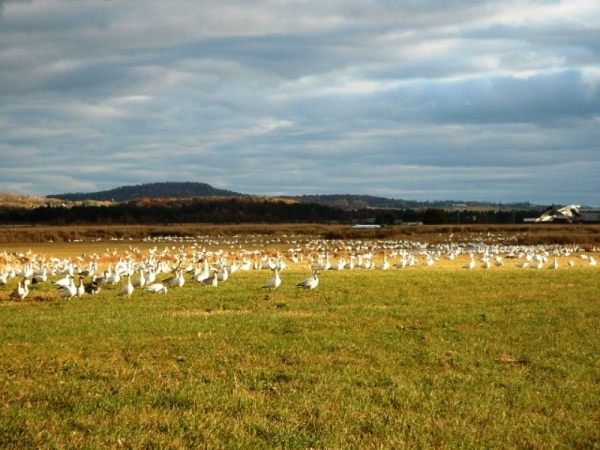 Sometimes, as you drive along the western end of Route 17 (between Route 22A and the Champlain Bridge) the fields are "white" with Snow Geese. On the eastern side of Addison is Snake Mountain. Snake Mountain offers great hiking, mountain biking and trail running. The view from the top of Snake Mountain, across the Champlain Valley to Lake Champlain and the Adirondack Mountains beyond is well worth the effort to get up there! Find the latest real estate for sale in Addison below. Save valuable time in your property search by registering here. You'll be able to keep track of your favorite listings and receive email alerts whenever a similar property come on the market. Click here to view a drone video of this property. Motivated Seller! Priced below town assessment. Lovingly well maintained Tudor style home on more than 10 acres with 176 feet of lake frontage. The owners dreamed of having a Bed and Breakfast so that many people could enjoy the lake. What's your dream? This five bedroom home has a bonus accessory apartment for overflow guests! Gleaming hard wood floors, unique architectural details, enviable amounts of storage, tons of hobby space in the basement and/or in the ready-to-finish attic. There is a large, flat backyard with lots of space for gardening. Sunsets are amazing from the front porch of this Lake Champlain home. The master bedroom windows have a view of the lake and of the Adirondacks. What a great way to wake up! There is a two car attached garage and a shed for extra storage. The basement has a workshop, a craft room, storage shelves and space for a game room. Central air, central vac, a generator, a pellet stove, reading nooks, newer windows and siding complete the package! Come and see this gem today! Click HERE for a virtual tour of this property! This adorable year round cottage on the shores of Lake Champlain is in a great spot! Located north of the bridge with 160' of lake frontage, the property includes a new dock system for summer fun! The large, double lot has room for gardens, or set up a fire pit and gaze out at the lake and the stars... Fully renovated in the past few years, the house has three bedrooms and a 3/4 bath. Maple floors throughout, with a slate floor in the year round porch- with a wall of windows facing the lake. The updated kitchen has a beautiful farmhouse sink, and wood countertops. A newer roof, plumbing, water heater, water softener and windows- the hard work has been done! Now it is time for you to just enjoy! Close to the local marina, walking distance to the local snack bar/ice cream stand, but off the main road. Enjoy this house all year, or just use for your summer escape- the choice is yours!